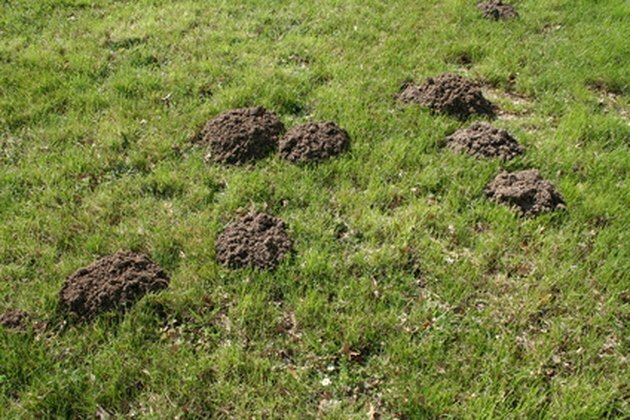 Moles living in your lawn can lead to dead plants, mounds of piled soil and damage to the grass. These small creatures are not rodents but are as pesky as them. They feed on grubs, worms and other lawn insects. Maintaining a pest-free lawn will discourage moles from returning, but contrary to popular belief, it will not rid the yard of them. A large lawn will have several active tunnels, with each needing treatment to get rid of these pests. Dirt mounds are signs of active mole tunnels. Check with local authorities to ensure that killing the moles invading your lawn is in accordance with state and local laws. Some states prohibit the killing of these pests. Identify active tunnels in your lawn. Stomp on a section of each tunnel. Check the tunnel in 24 to 48 hours. If the damage has been repaired, the tunnel is active and treatment should begin with these tunnels. Locate the entrance to the active tunnels. Place mole bait containing Breomethalin inside the tunnel. This bait is effective in killing moles, which consume it because it looks and smells like worms and grubs. Re-apply the bait to the tunnel entrances until activity has ceased. Stomp a section of the tunnel again and wait 24 hours. If the tunnel shows no signs of rebuilding, discontinue treatment. Christina Wheeler has been a professional freelance writer since 2007. She lends her expertise in animal care, gardening and home improvement to online publications such as Garden Guides and eHow. Wheeler studied business management at Ohio University. What Are the Plants for a Gopher Repellent?